Map o Zakarpattia Oblast wi Uzhhorod. Uzhhorod or Uzhgorod (Ukrainian: Ужгород pronounced [ˈuʒɦoˌrɔd]) is a ceety locatit in wastren Ukraine, at the mairch wi Slovakie an near the mairch wi Hungary. 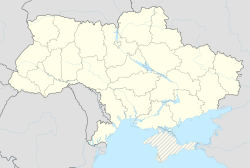 It is the admeenistrative centre o the Zakarpattia Oblast (region), as weel as the admeenistrative centre o the surroondin Uzhhorod Raion (destrict) athin the oblast. The ceety itsel is designatit as its awn separate raion athin the oblast. The ceety gets its name frae the Uzh River, whilk divides the ceety intae twa haufs (the auld an new sections). Uzh (Уж) means ringed snake (Natrix natrix), an horod (город) is Rusyn for ceety, comin frae Auld Slavonic grad (градъ). Housomeivver, this name is a recent big, an haes been uised anerly syne the beginnin o the 20t century. Afore then, the ceety wis kent as Ungvar, spelled Ongvar, Hungvar, an Unguyvar an aw, a name derivit frae the Onogurs, a Hunno-Bulgar fowk wha gaun athort the Volga in the 5t century AD. It is kent bi several alternative names an aw: Czech: Užhorod; Slovak: Užhorod; German: Ungwar, Ungarisch Burg; Pols: Użhorod; Romanie: Ujhorod. The best kent o the first ceety foonders are early Slavs. ane o thair tribes – White Croats – settled the aurie o the modren Uzhhorod in the seicont hauf o the first millennium AD. Durin the 9t century a fortifee'd castle chyngit intae a fortifee'd early feudal toun-dounset, which became the centre o a new Slavonic principality, at the heid o which wis a legendar prince Laborets, who wis vassal o Great Moravie. In 895 AD Hungarian tribes, heidit bi thair leader Árpád, stormit the Hungvar fortress. The forces wur no equal an Laborets wis defeatit an beheidit on the banks o the river that still cairies his name. Efter the income o the Hungarians, the smaw toun began tae extend its borders. In 1241–1242 the Mongols o Batu Khan burnt the dounset. In the air 14t century Uzhhorod shawed strang resistance tae the new Hungarian rulers o the Anjou dynasty. Frae 1318 for 360 years, the Drugeths (Italian coonts) awned the toun. In that period Philip Drugeth biggit Uzhhorod Castle. Thegither wi the castle the ceety began tae grow. Bi 1430, Uzhhorod acquired some privileges frae the keeng an wis offeecially cried "The Privilegit Ceety o Ungvar" an became caipital o Ung Coonty. Durin the 16–17t centuries thare wur mony handicraft corporations in Uzhhorod. In this period, the ceety wis engagit in the releegious fecht atween primarily Protestant Transylvanie an Catholic Austrick. In 1646 the Uzhhorod Union wis proclaimit an the Greek-Catholic kirk wis established in Subcarpathie, in a ceremony held in the Uzhhorod castle bi the Vatican Aegis. In 1707 Uzhhorod wis the residence o Ferenc II Rákóczi, leader o the naitional-leeberation war o Hungarians against Vienna. The beginnin o the 19t century wis characterisit bi economic chynges, includin the first factories in the ceety. The greatest influence on Uzhhorod amang the poleetical events o the 19t century wis made bi the Hungarian Revolution o 1848-1849, in whilk the native Hungarian nobility socht baith tae get free o the Austrian Empire an tae assert thair richt tae dominate aw ither fowks o Hungary. 27 Mairch 1848 wis offeecially celebratit in the ceety as the owerthrow o the monarchy in Hungary. In 1872 the first railwey line opened, linkin the ceety tae the important railwey junction o Chop. Accordin tae the 1910 census, the ceety haed 16,919 indwallers, 13,590 (80.3%) o whilk wur Hungarians, 1,219 (7.2%) Slovaks, 1,151 (6.8%) Germans, 641 (3.8%) Rusyns an 1.6% Czechs. At the same time, the municipal aurie o the ceety haed a population componit o 10,541 (39.05%) Hungarians, 9,908 (36.71%) Slovaks, an 5,520 (20.45%) Rusyns. Warld War I slawed doun the tempo o ceety development. On 10 September 1919 Subcarpathie wis offeecially allocatit tae the Republic o Czechoslovakie. Uzhhorod became the admeenistrative centre o the territory. In thir years, Uzhhorod developit intae a airchitecturally modren ceety. Efter the Munich Treaty, Uzhhorod became pairt o the Slovak hauf o the new Czechoslovak state. Uzhhorod's umwhile synagogue, nou the Philharmonic Orchestra. Bercsényi Palace in Uzhhorod Castle. Efter the Vienna Award in 1938, Uzhhorod wis retransferred tae Hungary. This period brocht significant chynges. At the ootskirts o Uzhhorod new enterprises wur constructit an the auld enterprises wur renewed. On 29 Juin 1945 Subcarpathie Ukraine wis annexed bi the Soviet Union an became a wastmaist pairt o the Ukrainian SSR. That year, the Uzhhorod State Varsity (nou Uzhhorod Naitional Varsity) wis opened an aw. Syne Januar 1946 Uzhhorod wis the centre o newly formed Zakarpatska Oblast. Syne 1991 Uzhhorod haes acome ane o 23 regional caipitals athin Ukraine. Oot o thaim, Uzhhorod is the smawest an wastmaist. In 2002, efter some controversy, a bust o Tomáš Garrigue Masaryk, Czechoslovakie's first preses, wis unveiled in a main square o the ceety. A seemilar bust wis unveiled in 1928 on the 10t anniversar o Czechoslovak unthirldom, but wis remuivit bi the Hungarians whan thay teuk ower the region in 1939. Uzhhorod is servit bi Uzhhorod railwey station an haes railwey connection wi Chop (further tae Hungary an Slovakie) an Lviv (further tae Kiev). Uzhhorod is servit bi Uzhhorod Internaitional Airport wi direct flichts tae Kyiv. Local public transportation is representit bi buses. Firthen Greek-Catholic kirk in the Museum o Fowk Airchitectur. ↑ "Ung County". Genealogy Online. Retrieved 17 March 2007. ↑ 4.0 4.1 "Climatological Information for Uzhhorod, Ukraine". Hong Kong Observatory. Retrieved 26 April 2012. ↑ "Zakarpattia Region". Ukrainian 2001 census. Retrieved 17 March 2007. ↑ "Krosno Official Website – Partner Cities". (in Polish) [[copyright|]] 1998 – 2001 Urząd Miasta Krosna. Retrieved 23 October 2008. ↑ "Jarosław Official Website – Partner Cities". (in Polish) [[copyright|]] 2008 Urząd Miasta Jarosław. Ul. Rynek 1, 37–500 Jarosław. Retrieved 23 October 2008.